Magma Firestop specialise in the development, manufacturing and marketing of an extensive range of fire retardant products and high performance coatings. The world-wide established distributors and agents are controlled from Magma’s Head Office in the Netherlands. All of the products are both environmentally as well as user friendly and make greater fire safety available to as many people as possible. Magma has seen a 500% global increase in production (2014) in response to increased demand for its excellent products. Magma Firestop for thatched roofs has been tested and used internationally so it is proven and trusted in the fight against thatch fires. It is a spray which gives protection from fire risks in the form of sparks, flying embers, fireworks, Chinese lanterns, bonfires, barbeques. 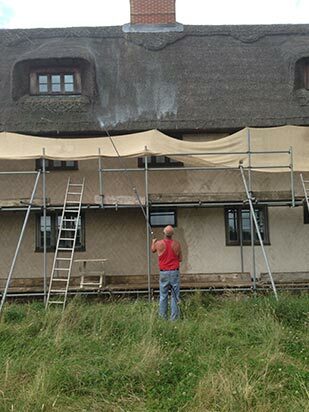 There are external and internal sprays for thatch depending on client requirements. The Magma concept of protecting thatched roofs has received many endorsements from leading international test institutes and has proven itself over many years in many countries. It is tested in the UK under BS476 Part 3, receiving an A rating for spread of flame. It has also been tested in many other countries. The manufacturing process is ISO 9001:2000 certified and complies with OECD guidelines during manufacturing and application processes. Magma only works with specially trained operators to apply the products, to ensure the quality of the application. Treatment Certificates are supplied to customers as proof of spraying to Magma’s standards. In the UK the majority of sprayers are Master Thatchers which ensures care of your roof at all stages. The procedure of the treatment of thatched roofs is embedded in Magma’s NEN-EN-ISO 9001 Certified Quality Assurance handbook. Magma Firestop products (unlike other fire retardant sprays for thatch) do not contain any toxic elements (like borates) and are safe to handle. All products have been tested to ensure they will not react adversely with different kinds of thatch. These are some of the reasons why insurers (and underwriters) are trusting application of Magma Firestop in reducing thatch fire risks and so offer reductions in premiums as well. We and our operatives are committed to contributing to fire safety. As all magma products, this is tested and used internationally on many different woods. Those used in the construction industry have found benefit in increasing fire resistance, especially on buildings near boundaries or internal structures where fire hazards require additional fire protection. We are happy to talk to you regarding your property or project and how Magma Firestop can help reduce your fire risk and increase your peace of mind. If you have any queries on any of the Magma products, external or internal fire sprays for thatch or wood sprays, please do not hesitate to contact us.